Bit misleading. 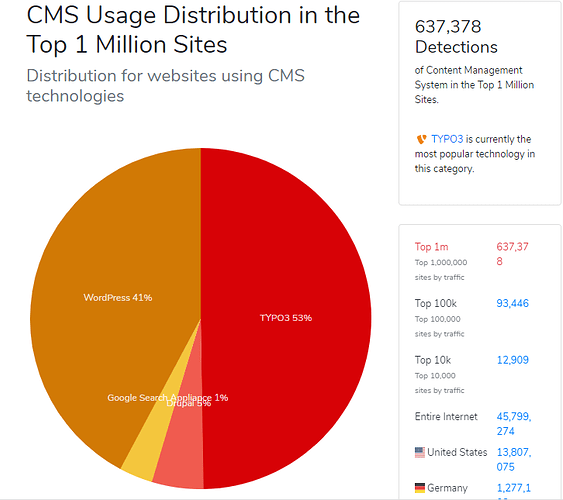 What it’s actually saying is that TYPO3 is more popular among sucuri customers then WordPress. Which is a really small sample pool and biased into favor of people suffering attacks. Also the official sources only account for sites with a lot of traffic, not accounting for WPs popularity with a lot of very small sites. Yeah, it does surprise me how quick they rose recently, but on the other hand… Typo3 is made for big sites. Smaller ones are maybe those who installed close to 5M Classic Editor plugin, rated 1.9/5.0 Gutenberg and soon be moving to ClassicPress, right? Hot news: so-called security company actually more interested in producing clickbait! For something a bit more realistic, try comparing this with this.